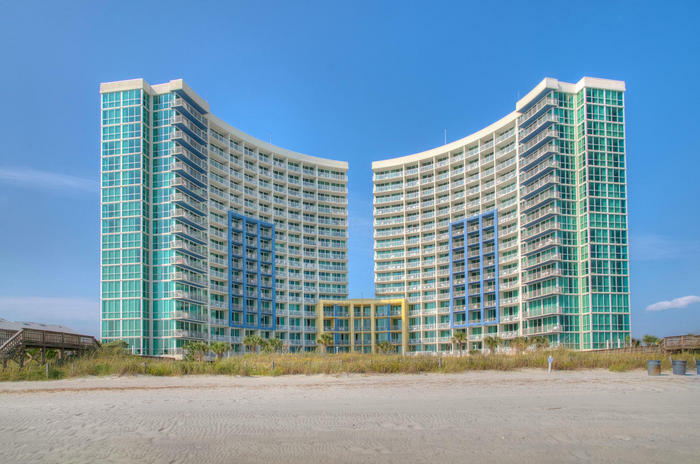 Each North Myrtle Beach condo rental at Avista Resort is uniquely designed. Most of these condos in North Myrtle Beach, SC have Internet access and at least one DVD player. Some of these North Myrtle Beach rentals have a wall of windows that offers breathtaking views of North Myrtle Beach, SC and the Atlantic Ocean. You will find that some of the North Myrtle Beach condo rentals at Avista Resort have two balconies. If you prefer a washing machine and clothes dryer in your private North Myrtle Beach rental you can have it at this North Myrtle Beach resort. Otherwise laundry facilities are available on the fourth floor. The smaller North Myrtle Beach condominiums have a small galley kitchen with a stove/oven, refrigerator and dishwasher. The larger condos in North Myrtle Beach boast a larger kitchen. All of the kitchens are nicely furnished. For your convenience there is a fitness center on site at Avista Resort. Use the weight machines at this North Myrtle Beach resort to maintain your workout schedule. For fun you might want to swim laps in the swimming pool before it gets crowded for some cardio work or go for a run on the beach any time of day and enjoy the fresh air and beautiful landscape. Your North Myrtle Beach vacation days will be beautiful when you reserve a condo at Avista Resort. Palm trees line the beachfront and wooden boardwalk leads from the oceanfront pool deck to the white sandy beaches. Kids and adults alike love to go barefoot on the sand and comb the beach for seashells. Build sand castles and swim in the ocean. Try surfing the waves and walk out to the sand bar at low tide in search of sand dollars. There is an on-site restaurant at Avista Resort so you do not have to leave this North Myrtle Beach resort or prepare a meal in your North Myrtle Beach condo to get a bite to eat. Let us do the cooking for you. Dine on seafood and top off your meal with a nice glass of wine. Order a frozen cocktail in the lounge at the end of the night. The Avista Resort parking garage is across the street from this oceanfront retreat. Keep your vehicle out of the sun and heat and worry not about finding a parking place in this seaside town. Morning, noon and night it is convenient to park your car and get back to the comfort of your North Myrtle Beach rental at Avista Resort. This North Myrtle Beach resort is not only situated on a beautiful stretch of beachfront in the Ocean Drive section of North Myrtle Beach, South Carolina. It is also in such close proximity to North Myrtle Beach amusements and Myrtle Beach attractions that you will have a ball exploring all there is to see and do in town. From the Myrtle Beach SkyWheel that gives you bird’s eye views of the ocean and the Myrtle Beach landscape to the waterfront dining opportunities that invite you to enjoy a peaceful meal while watching the sunset over a salt marsh inlet or over the pine trees that line the Intracoastal Waterway. Play a round or two of amazing Myrtle Beach golf at one of the Myrtle Beach area’s 100-plus golf courses. There are award-winning golf courses that offer a challenge you will appreciate. Take a golf lesson or hit the driving range and get through a bucket of balls before teeing off on 18 holes. Dining in North Myrtle Beach, SC is fun because there are so many wonderful restaurants from which you can choose. The seafood in town is terrific and raw bars feature all your favorites along with steamed shrimp, fried fish, homemade clam chowders and all-you-can-eat crab legs. Make it a memorable North Myrtle Beach vacation by making reservations for Avista Resort in North Myrtle Beach, South Carolina.